Sweet! They look so happy! These are soooooooooo cute! I wish I knew how to knit just so I could make one! Thanks! I’m tackling crochet at the moment but once I have conquered that knitting may be next! Thank you! I was looking for photo ideas around the house because I didn’t want to go outside due to the super super hotttttt.weather! Those are beeeutiful! I love your poem too!! These are adorable. I wish I’d found this when my granddaughter was born. Her nursery theme was bumble bees. How beautiful and delicate. Your work is lovely. I love bumblebees! These are absolutely adorable! Awww thank you! 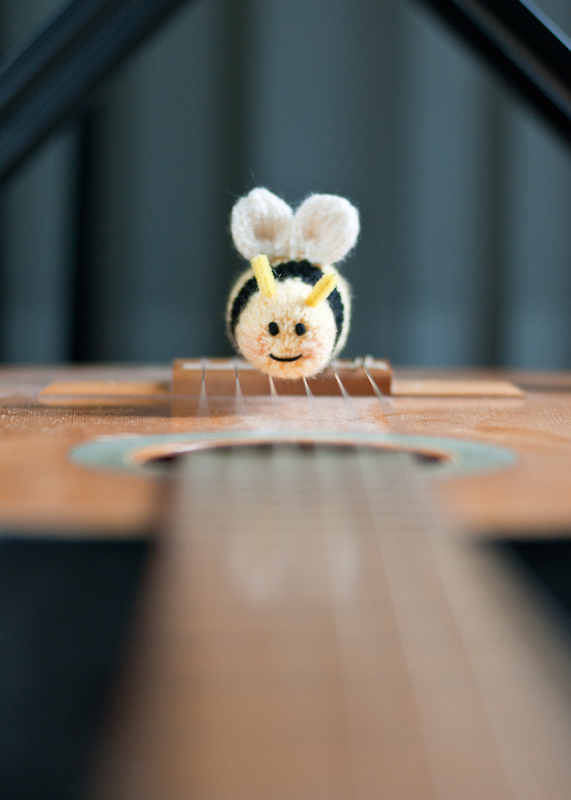 :D Do you have a collection of bumblebee toys? No, but who knows, I might start one some day ;) I just love to see them fly around, all fat and fluffy haha! Thanks for sharing your pretty creations! Those are just adorable! And the apples you shared earlier and yummy looking, in a yarn sort of way, haha. Thank you for sharing them and the link to the pattern! I just might! Those would be really cute for freebies at my craft booth. So cute!! Thanks for reading. *squeeeeee* They are so adorable! Thanks for sharing them and for those wonderful and cute fotos – they brightened my day. So, so cute! They made me smile instantly, and I just love their little faces. I’m not but thankfully you are. So I get to see and enjoy your creativity. Really brighten up my day looking at your work. Thank you!!! :) And your blog is delicious! I wish I can cook… I tell myself often, If I can follow instructions on how to extract my own DNA in the lab, then I can definitely follow cooking instruction. But, it is not true :(. I’m married to a Immunologist, he can cook. Try a recipe just for fun! It’s why I started the blog. And I’m having fun with it! Thanks for following me! I love your stuff, it’s so cute and just makes me smile. I appreciate all the time that you’ve put into your projects, and they look like they’ve been sew together with care. You take amazing photographs of your knits! 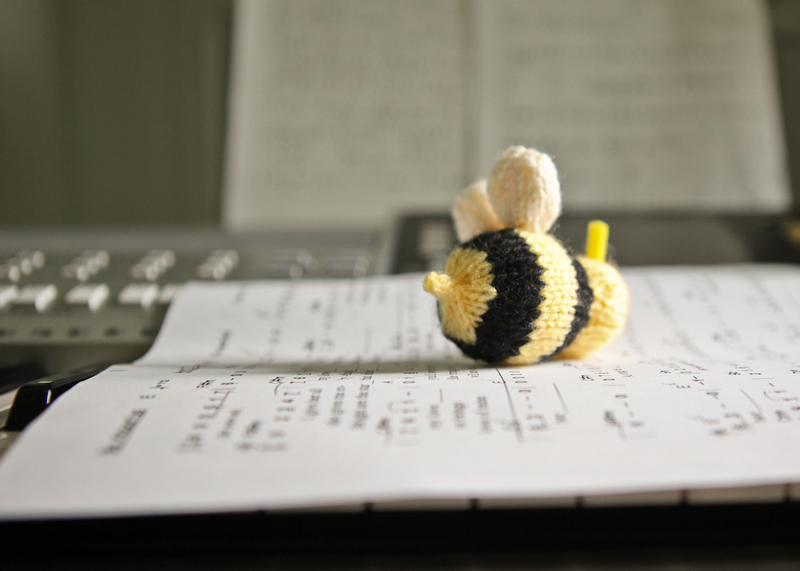 How many bees did you make? Looks like a lot! Did you get bored of the pattern at all? Hello! i found your blog after you followed mine! Thanks for the follow! I love your bees and the birds beneath! My mum is crocheting baby blankets and booties for her doula clients, so I have asked her to teach me! It looks fun, hopefully I won’t drop too many stitches! If you have any farm animal patterns/ideas, I would love to know! p.s. Can I ask how you found my blog? Thanks! Hey, thanks for “liking” my blog! (http://karendibee.wordpress.com) I love yours too! 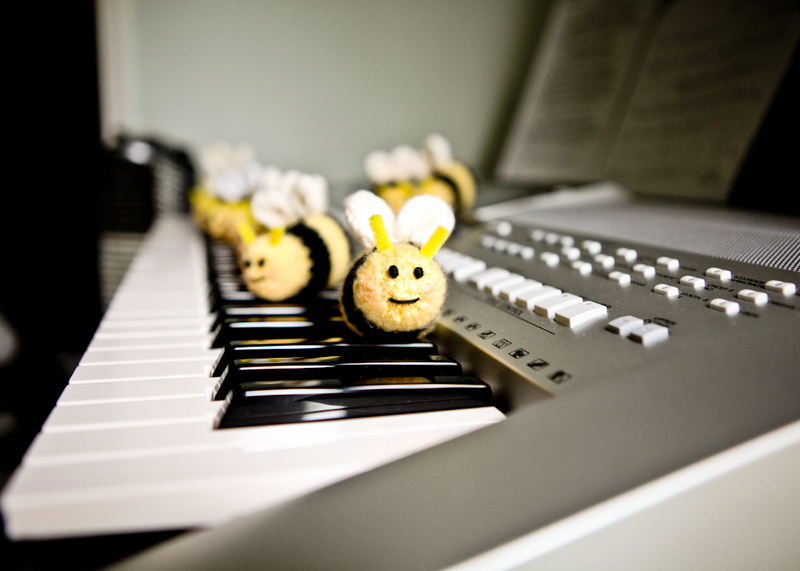 I love these bumble bees. I have been sticking to crochet lately, but I think I’ll have to get the ol’ knitting needles out again. I have a big tree branch in a pot in my house that I hang various cute things in. 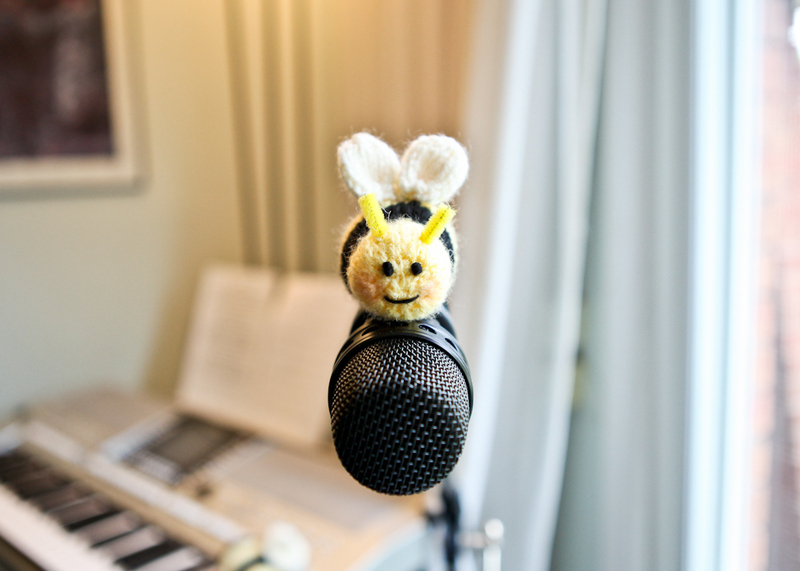 I will definitely have to add these bees! Thanks! That’s such a great idea!!!! 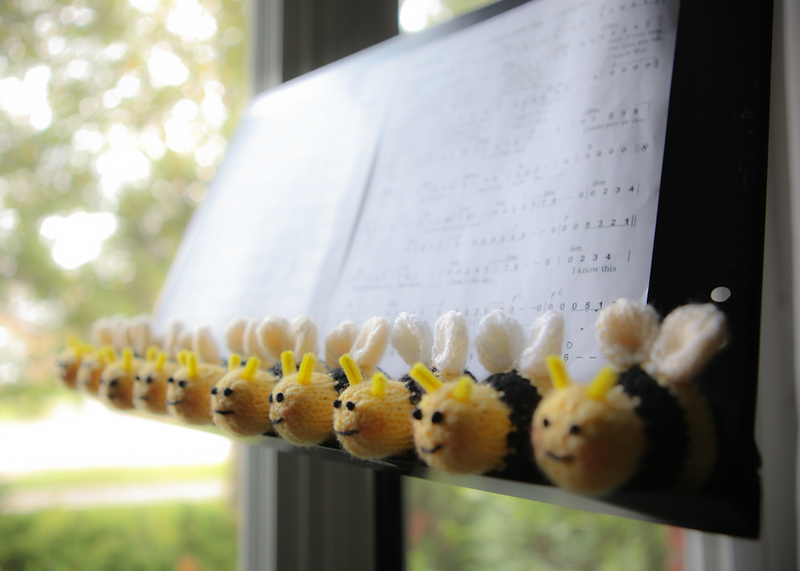 The bees would look absolutely adorable hanging on the tree branch! I’d love to see pictures when you are done :D! 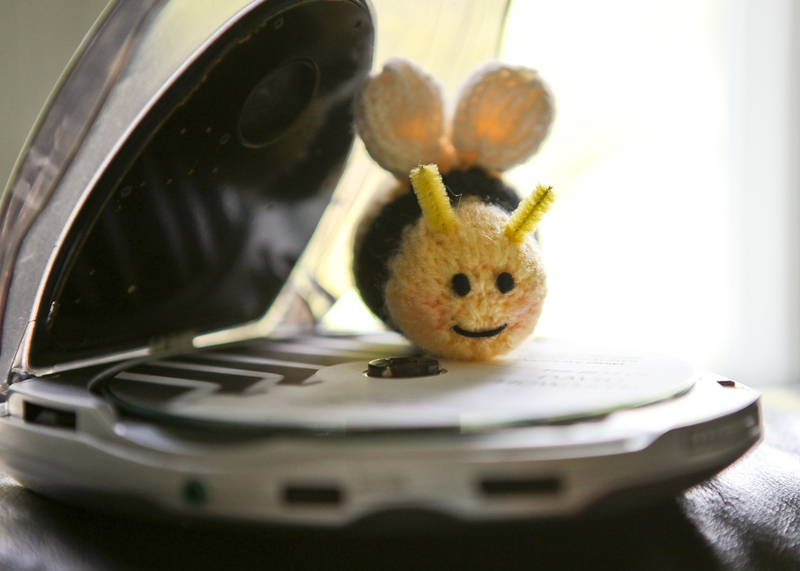 Ooooo These bees were requested by a mom to her daughter who works in a bee lab! 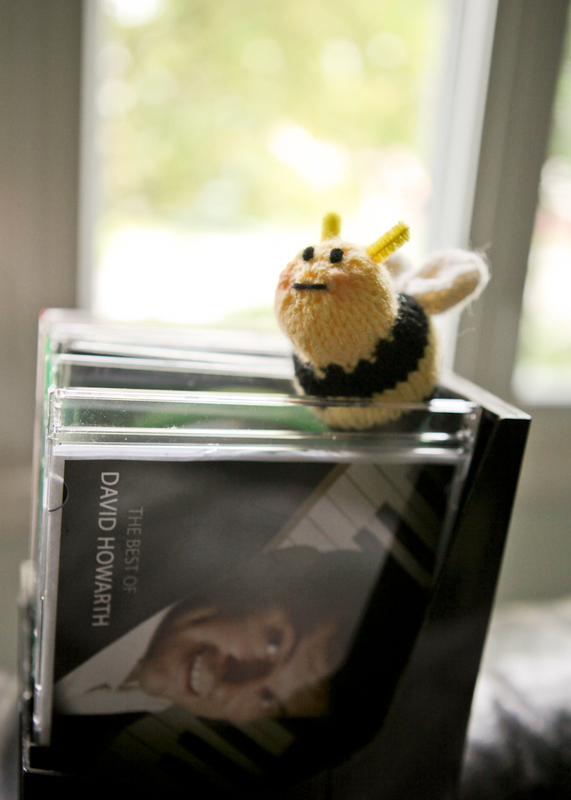 She has quite a large collection of bee toys! 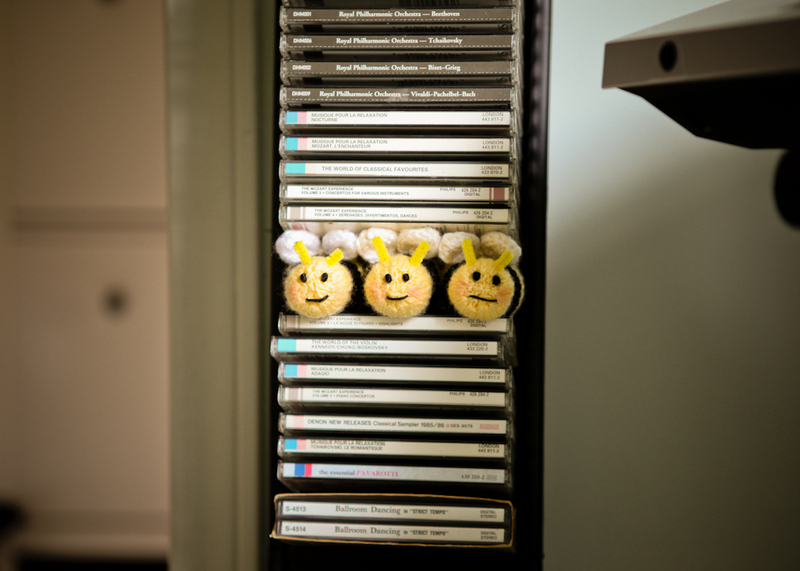 Does your friend collect all sorts of bee ornaments/toys as well? To be honest, I’m not sure. But she’s gotta love bees in order to be a beekeeper, I would think. lol She does love crafts too though, I know that. 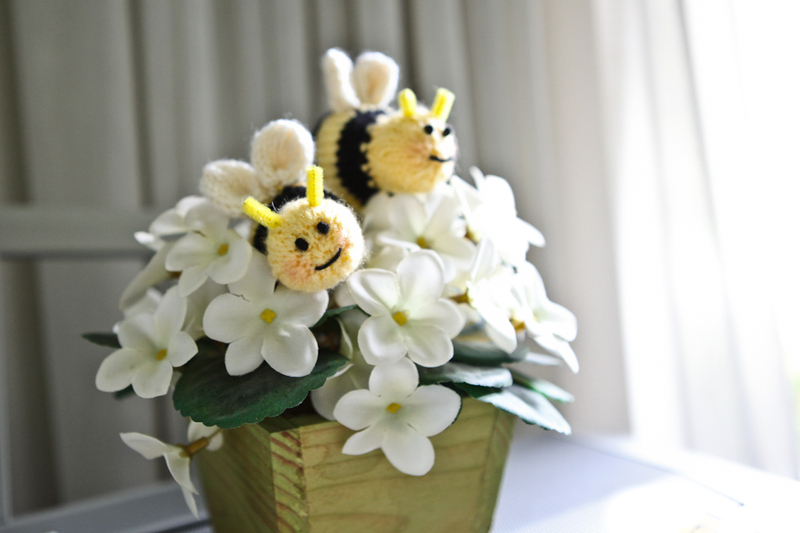 Those bee’s are super cute! 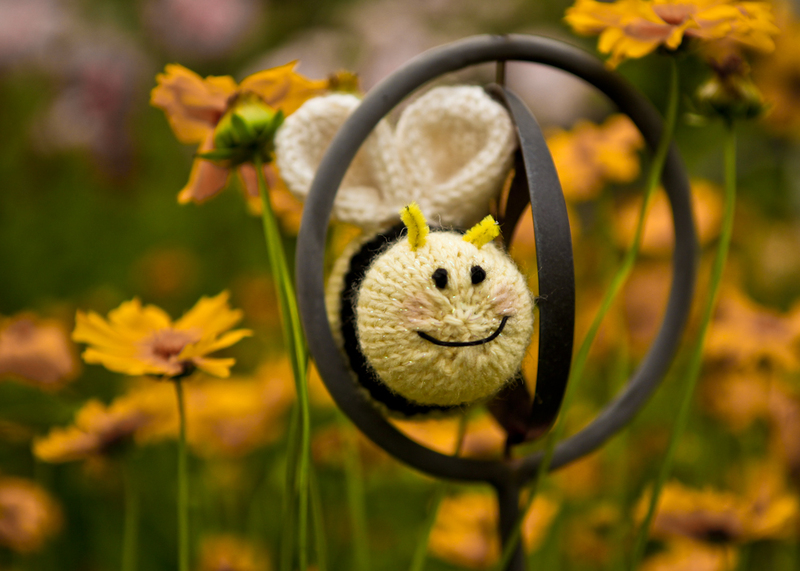 Thanks for stopping by my blog and liking my post – I love these little bees and the monkeys in your profile, will definitely have to try them if I ever get back into knitting! These are so stinkin’ adorable! 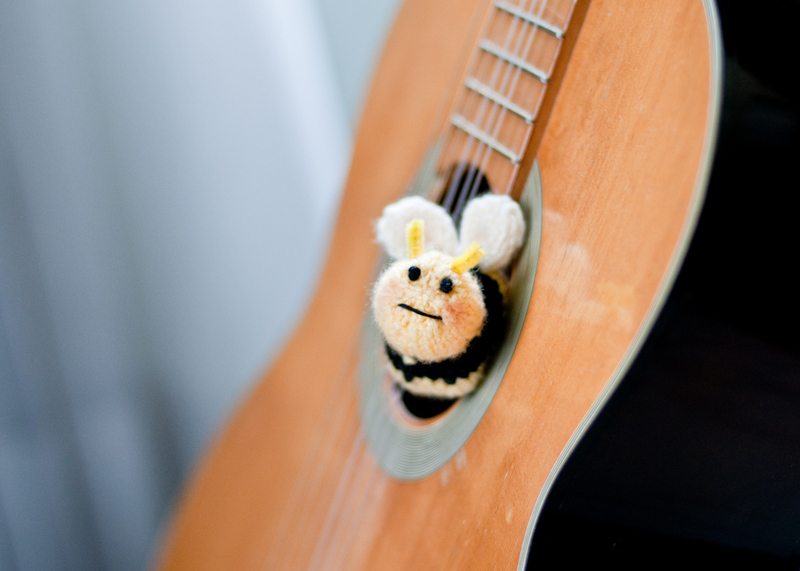 I’m on a kick right now where my husband + I have a little trinket that we take turns hiding around the house for the other to find [think “Elf on a Shelf” style] and these little bees would be perfect to join in on that fun! Love ’em, plain and simple. Wow! They are soooooo cute!